According to The Guardian, people complaining that Christmas has come too early is an age-old tradition: as early as 1901, the Philadelphia Inquirer bemoaned the early buying of Christmas presents. However, apart from a few bar humbugs, the consensus from those that it interviewed thought that tinsel and twinkling lights straight after Halloween gives us a much-needed boost in the dark winter nights and something to look forward to until we can all come out of hibernation in the spring. So, feel unashamed when you visit Harrogate Christmas & Gift and prepare to stack you shelves high with Santa gifts, elves and glittering unicorns for Christmas 2019 – as visitors to the show told us last year – it’s never to early to plan for Christmas! Who can resist adorable puppy eyes? 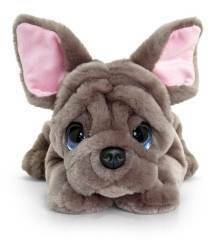 In particular, the latest new litter from Keel Toys – Cuddle Puppies. Your customers won’t be able to say no to the appealing eyes, each bespoke to the breed of dog in size and colour, including blue, green and brown variations; plus, weighted paws and a floppy body just asking to be loved and hugged. There are 12 designs in the 25cm size including old favourites like the Labrador and Husky; plus new breeds to the collection: French Bulldog, Labradoodle and the Wheaten Terrier. These are presented in a floor display which also features fabulous collars to purchase separately. Larger versions are also available in 32cm, 37cm and 47cm sizes – and to complete the Cuddle Puppies collection, there are 12 Standing Puppies with Lead which have always been a toy favourite. In December 2013, Martin Watson returned home with his ‘perfect’ Christmas tree and placed it in a plastic ‘dog bowl’ look alike tree stand and started the usual cover up job. This included a box around the stand covered with festive wrapping paper – and ‘job done’ the tree stand was successfully disguised for another Christmas. 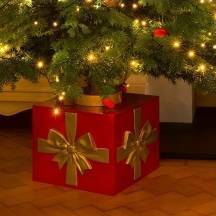 However, knowing that he couldn’t be alone in having to disguise his tree stand every year, Martin has come up with an innovative, feature packed, patented Christmas tree stand for both real and artificial trees – The All About Christmas Tree Stand – designed to be seen and presented for the first time at the show this year. 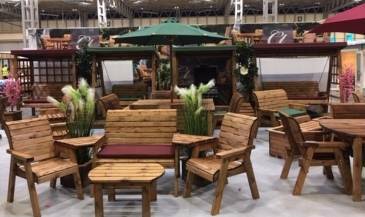 Handcrafted on the edge of the Peak District, Charles Taylor Trading’s furniture has a true traditional touch and with its ergonomic design, not only is it comfortable, but helps with posture and increases relaxation. Quality and satisfaction are priorities and therefore all Charles Taylor Trading products are thoroughly inspected by in-house craftsmen, ensuring only the best quality furniture is produced. The company’s white glove delivery service means that its drivers will help throughout the whole process, placing the products and assembling for your convenience.